Salute Life will once again take over the city with our Unplug Art Experience . 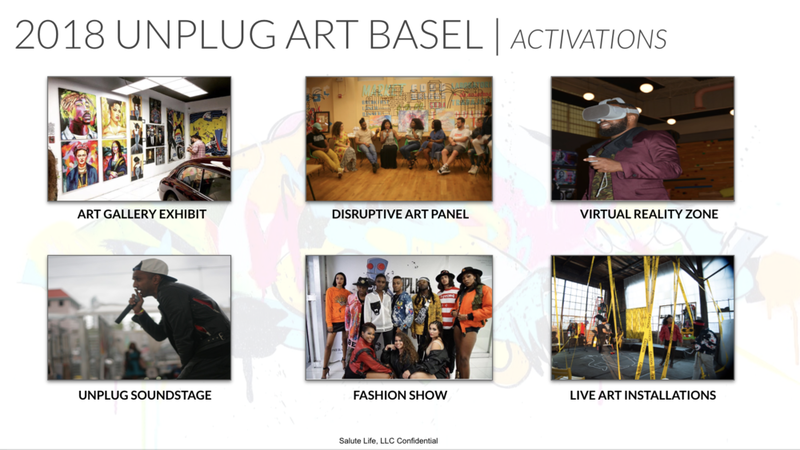 Unplug is a win for the artists participating as we take no commissions from their artwork sold. Guests can revel in the fact that they are unplugging for a cause as well since a portion of event proceeds will go towards a local charitable organization in the community. Shana is a Canadian Figurative Artist, Business Woman and Movie Producer (Executive Producer and Producer of 'Diablo' starring Scott Eastwood, Danny Glover and Walton Goggins). The grave injustices that plague society has given birth to critical movements like #metoo and #blacklivesmatter, and has inspired Shana to dedicate her artistic voice to these important causes. We must loudly promote and practice equality and inclusivity. Speak, march, vote, write, intervene, support, donate, love. For Shana, it is to paint. Christy Ayala is a vivacious, self-taught, Latina artist born in Harlem, New York and raised in the Bronx, New York. Her artwork is inspired by personal experience that conveys a message of love and pain, as well as an interpretation of her surrounding environment. Christy is a visual artist that creates her unique urban, surrealist, abstract pieces using acrylic paint. She is open to many creative paths such as, graphic design, drawing, painting, and any types of art form that allows her to create new and unique works of art. Texas native and graduate of Lamar University, Evita’s work of art consists of collages with cubism influences. Her work has been commissioned by the Essence Music Festival in New Orleans, Dallas’ Deep Ellum Film Festival, the 30th Annual New Orleans Jazz and Heritage Festival. "I want to create a realm where women of color can see their reflection without a mirror – representation is important." A self-taught artist, Tatiana's work is centered around femininity, self-love, and appreciation of women of color. Her preferred mediums are watercolors, oils, and digital media, through which she conveys a sense of intimacy that envelopes you and invites you to fall in love with women of color from all backgrounds.